Introduced in 2016, the Lower House of the Parliament passed the Surrogacy Regulation Bill on December 19, 2018. The Bill seeks to completely prohibit commercial surrogacy and makes it an offence punishable with imprisonment of a minimum term of 10 years. However, it permits altruistic surrogacy, which is defined as the surrogacy services given to a person who is genetically related to either of the intending parents, without any monetary considerations. Moreover, the Bill limits surrogacy services only to legally married Indian couples, who have been married for a period of at least 5 years and are clinically certified as infertile. It also prohibits abortion or abandonment of any such child and considers that child a legal offspring of the intending parents. Express News Service, Lok Sabha passes Bill to check commercial surrogacy in India, Indian Express (December 20, 2018). Manu Sebastian, Lok Sabha Passes Surrogacy Regulation Bill To Prohibit Commercial Surrogacy, LiveLaw (December 20, 2018). Neetu Chandra Sharma, Lok Sabha passes surrogacy bill in likely boost for adoption in India, Livemint (December 20, 2018). PTI, Lok Sabha Passes Surrogacy Bill, The Wire (December 19, 2018). Flavia Agnes, Surrogacy Bill reflects regressive family ethos, The Tribune (January 4, 2019). Shimona Kanwar, Chandigarh Doctors pick holes in Surrogacy Bill, The Times of India (January 2, 2019). The Ministry of Home Affairs has authorized ten central agencies to intercept, monitor and decrypt “any information generated, transmitted, received or stored in any computer” via a late night order. It has also empowered these agencies to seize any device in the course of the same, thus extending the scope of the order to the possibility of physical whimsicalness. The order was issued under Section 69(1) of the Information Technology Act. It has attracted severe criticism from civil-society members, politicians and technical experts, who see this as an attempt of the government to increase surveillance in the country. The government later clarified that the law was not new, and it had only identified the agencies which needed such power. These agencies include the Intelligence Bureau, Enforcement Directorate, Central Bureau of Investigation, RAW and 6 others. According to the notification, any person refusing to cooperate shall face imprisonment and/or fine. BQ Desk, Government Allows 10 Central Agencies To Monitor, Decrypt Any Computer Data, Bloomberg | Quint (December 21, 2018). Press Trust of India, Govt authorises 10 central agencies to monitor any computer; sets off political storm, Business Standard (December 21, 2018). Varun Nambiar, India cyber surveillance order sparks controversy, Jurist (December 22, 2018). ET Online and Agencies, 10 central agencies can now snoop on “any” computer they want, The Economic Times (December 21, 2018). 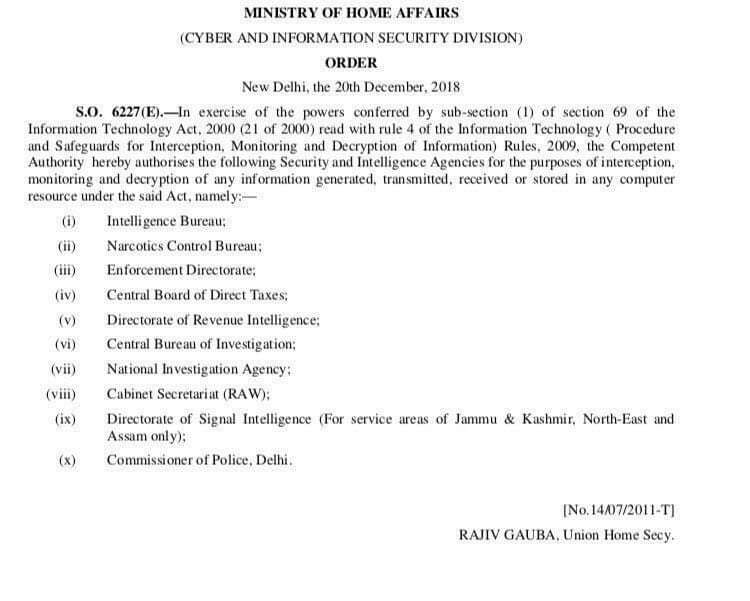 Live Law News Network, Home Ministry Authorises Ten Central Agencies To Monitor Computers, LiveLaw (December 21, 2018). Tech2 News Staff, MHA authorizes 10 central agencies to intercept calls, data on any computer: Mamata, Omar, Owaisi slam move, FirstPost (December 21, 2018). The Delhi HC set a milestone by convicting the powerful Congress politician and ex-parliamentarian Sajjan Kumar with imprisonment for life. He was convicted for conspiracy and murder during the 1984 Anti-Sikh Riots. The Court referred to the incident as “crime against humanity” and cited jurisprudence from the Nuremberg Tribunal and others in the progressive verdict. Recently, a judgment of the Delhi District Court also convicted one of the accused persons in the case with death sentence. Mr. Kumar has moved the Supreme Court challenging the conviction. The Wire Staff, Congress's Sajjan Kumar Sentenced to Life Imprisonment in 1984 Sikh Killings Case, The Wire (December 17, 2018). Varun Nambiar, India court sentences former parliamentarian to life in prison for orchestrating 1984 riots, Jurist (December 19, 2018). HT Correspondent, Who is Sajjan Kumar, convicted in 1984 anti-Sikh riots? Hindustan Times (December 17, 2018). Sajjan Kumar convicted: Akalis hail verdict, BJP points at Kamal Nath, Business Standard (December 17, 2018). Sanjay Hegde, The slow, tortuous path to justice: Sajjan Kumar's conviction, The Hindu (December 18, 2018). Somya Lakhani, 1984 anti-Sikh riots: The three witnesses who played a role in Sajjan Kumar’s conviction, Indian Express (December 24, 2018). PTI, Sajjan Kumar Moves SC Against Conviction In 1984 Anti-Sikh Riots Case, LiveLaw (December 22, 2018). Vietnam’s new cybersecurity law took effect on the 1st of January, amid criticism that it could harm free speech on the internet. The law gives powers to the Ministry of Public Service to audit internet systems after giving a notice of audit 12 hours prior to the same. Illegal content has been defined rather broadly, covering areas as wide as instigating violence, to violation of economic order. The law imposes liability on the information providers for illegal content that is hosted on their systems. Trinh Huu Long, Human Rights, Vietnam’s Cybersecurity Draft Law: Made in China?, The Vietnamese (November 8, 2017). Euan McKirdy, 'Stalinist' Vietnamese cybersecurity law takes effect, worrying rights groups and online campaigners, CNN (January 2, 2019). Jamie Fullerton, Vietnam criticised for 'totalitarian' law banning online criticism of government, The Guardian (January 2, 2019). Ralph Jennings, Cybersecurity Law: Vietnam Will Censor Internet, Not Close Websites, VOA (December 28, 2018). Reuters, US is worried about Vietnam's proposed cybersecurity law, First Post (May 25, 2018). Waewpen Piemwichai, Vietnam - New Cybersecurity Law Will Have Major Impact On Online Service Providers. Conventus Law (June 20, 2018). The Aadhaar Amendment Bill was passed on 3rd January, which permit individuals to offer their Aadhaar as a means of identity verification to avail services such as getting a sim card or opening a bank account. The Bill amends two other laws apart from the Aadhaar Act – related to money laundering and telegraph. The law also legalises the usage of offline verification, introduced recently by the Unique Identification Authority of India. Offline verification moves away from the biometric based authentication system, where the biometric data is validated against the biometrics registered under that Aadhaar number. Under this new mode of verification, the card-holder can provide either their QR code for scanning or give an XML file to the service provider to prove their identity, much like giving a photocopy of an identity card, though not as safe. The Wire Analysis, Why Modi Government is Amending the Aadhaar Act and What it Means for You, The Wire (January 2, 2019). Payaswini Upadhyay, Is Government Walking A Thin Line With Proposed Amendments To Aadhaar Law? Bloomberg Quint (January 4, 2019). Apar Gupta, The Aadhaar Amendment Bill Contravenes Privacy Judgment Of SC, LiveLaw (January 4, 2019). Anita Joshua, Aadhaar bill rings alarm bells, The Telegraph (January 3, 2019). Vivan Eyben, Is Aadhaar amendment bill meant to save Indian fintech firms? NewsClick (January 3, 2019). Suprita Anupam, Does Aadhaar Amendment Bill Violate the Supreme Court’s Verdict? News42 (January 3, 2019). Derick Thomas, What UIDAI doesn’t tell you about offline use of Aadhaar for KYC, Kaarana (November 19, 2018).